The smell of this mead in progress is awesome. The whole house smells of toffee and burnt sugar, and, inexplicably, brownies, and the delicious aroma lasts for days. Coming home to that smell is a joy. When it’s bottled, the color is very dark, like a porter, but with incredible clarity. The flavor is a combination of burnt sugar and a kind of almost maple flavor. One friend said it tasted the way a cotton candy machine smells, and I think that’s accurate. The finished mead, at three months, is a beautiful dark color. The flavor is unique, with spices abounding, and a slightly bitter, almost tannic element. In future batches, I would lessen the amount of spice compared to the proportions I used below, since medieval spices wouldn’t be as potent as our modern ones, not to mention very expensive. I’ll update this post with a photo of the finished mead once I crack open the next bottle! I think the possibilities with this style mead are countless. Candy apple cysers, toasted marshmallow mead, salted caramel, and something with vanilla. I’d also love to make a fortified version with whiskey. What ideas does it give you? A Note on Process: I looked at a lot of examples of this brew on forums, including photos and video. I think that many brewers mistake the direction about “black smoke” that appears in some translations as “black honey”, and perhaps overcook the honey. I watched as I brewed for a moment when the honey was forming sort of globules that spat smoke, and with my batch, that happened right around 25 minutes. I was briefly tempted to go darker, but instinctively felt that I was where it should be. Before you start this process: Pick a large pot that can handle approximately 4-5 times the volume of honey you start with, as it expands during cooking. Pour 1 gallon of water into this pot and make a mental/visual note of where the level of liquid comes up to: You’ll be reducing the mead mixture to this level in a later step. Pour the water out. Pour 2.5 lb. 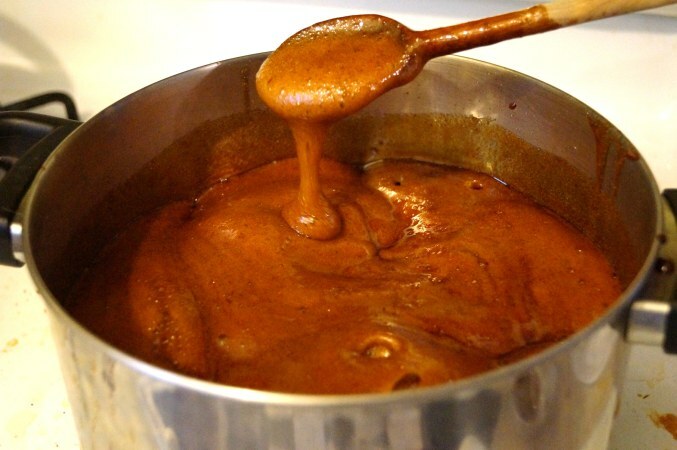 honey into a large pot, and begin to heat over medium-high. You’ll need to stir as you go, so have a spoon ready. As the honey cooks, it will begin to bubble and rise considerably. Take a look at the pictures below of the raw honey level compared with the level at the end. Constant stirring is key to keeping it from getting out of control. When it gets to a dark color, and begins to spit puffs of steam, I turn mine off. You’ll not go wrong turning it off sooner, but knowing when takes both fierce attention, good instincts, and some luck. Gradually add the water (careful, it spits like mad as it touches the honey! ), then boil the whole mixture until it is reduced to the previously noted 1 gallon level, about 30 minutes in my case. Allow to cool completely, then pour into a carboy and add the ale yeast. When racking into secondary carboy, add the spices in a mesh bag. Let those soak for 2-3 days, then remove. When the mead is done working, bottle. So when you say that you would “lessen the amount of spice” next time, and in the recipe to spice it for “2-3 days” … so now you would spice it for 1-2 days ? The spice will probably mellow with age too though. Omg yes!! Now I need honey caramels!! How long is the fermentation period, approximately? Also, it’s three months after bottling that it’s drinkable, right? Love the sound of this recipe but it would only be my 2nd brew, so a few questions. Firstly, I’d have to use dry ale yeast, when you say .8 of a cup what would that be in grams or ounces? (assuming its not a liquid measurement). Secondly how long do you leave it before racking and adding spices? I would be tripling this recipe to make about 4 litres. Thanks! “Barm” is the foamy yeast from the top of an on-going brew. So I assume this is a liquid measurement. I’m not sure Chelsea has unit-converted it, but 1US cp == 137 millilitres. I used 10 grams (1 packet) of US-05 yeast, which is probably a bit too much. But I would guess 5-10 grams would be OK. There’s quite a lot of very active yeast cells in barm. I’m about to put mine on top of the spices after 4-5 weeks in the fermenter. I will use the amounts listed in the recipe, and they will stay there for some weeks. Can’t wait to try this, but am not sure as to what “long pepper” and “grains of paradise” could be, please help! They are spices that were much more common in Medieval Europe than today. Grains of Paradise is similar to modern black-pepper, but a bit more complex taste. A good general substitution is just slightly less black-pepper. Long-pepper is also similar to modern black-pepper, but stronger. Just use black-pepper in equal proportions. Hope that helps! Some whole foods and organic food stores sell Grains of Paradise. You’ll often find it in the bulk spices section. Another good place to look for period spices, if you don’t have a local specialty shop,is Amazon. You’d be amazed what you can find there. Finally had a chance to try this recipe Saturday last (2 days ago, at this writing), and I have a question. I made a double batch – if I’m going to open a keg of honey, may as well use all of it, right? – and so I needed to reduce my total volume to 2 gallons. I didn’t think about it until AFTER I added the water (2.8 gallons for a double recipe), but why are we adding so much water to this recipe? Wouldn’t the same results be reached by only adding 2 gallons of water, and then boiling off the volume of the honey? Or even better, just add water gradually, titrating until you hit the 2 gallon mark, and then transferring to the carboy for cooling? I also notice my fermentation is a little feeble. But then, I have been making a lot of beer lately, so maybe it’s just that I’m used to seeing the beer being a little more vigorous. What sort of activity have you seen in your batches? It’s not necessary to add extra water then boil down. I suspect this may have been important in the distant past to make sure that the water was boiled until thoroughly safe for drinking. When I made my versions of this, I did not bother with this and it turned out great. Doing some number crunching on this recipe and trying to figure out where your numbers came from. How did you determine that you needed 1 1/2 pints of honey to the 1.4 gallons of water? Just curious…why do you think that medieval spices wouldn’t be as potent as modern? Is it a matter of distance X time? The title “burnt honey” is somewhat of a misnomer- I’m an addict of all things honey, and I think it would be a serious crime to actually burn honey! It’s more of a caramelization process, which isn’t quite as scary. Still, I understand the trepidation. Let me know how it turns out!